How should I read my Ethnicity Estimate? 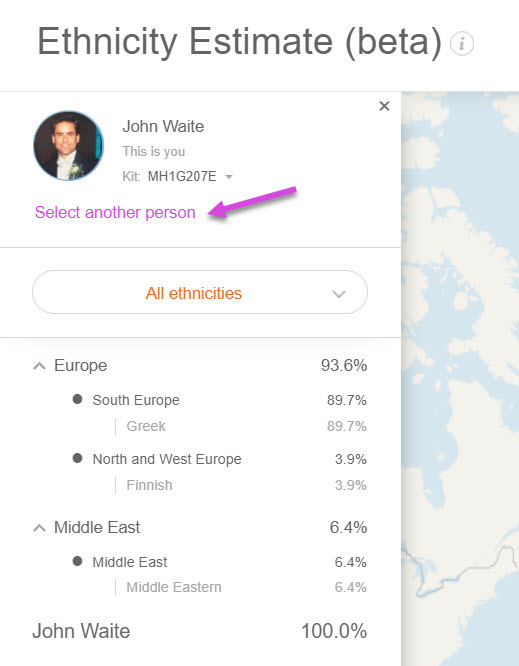 If you only manage one DNA kit, you will see directly the corresponding Ethnicity Estimate on the next page. If there are more than one DNA kit associated to a profile, click the drop-down menu just below the name and select the kit you wish to display results for. For each region of your ethnicity results, we look at the estimated value and the range to evaluate the evidence that you have the region as part of your genetic ethnicity. 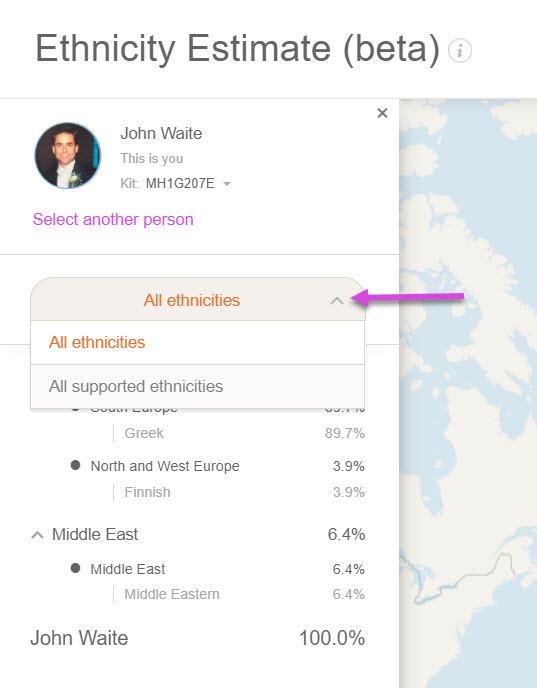 All ethnicities (default view) - Under the “All ethnicities” view, we show you all the populations of your ancestral origin. 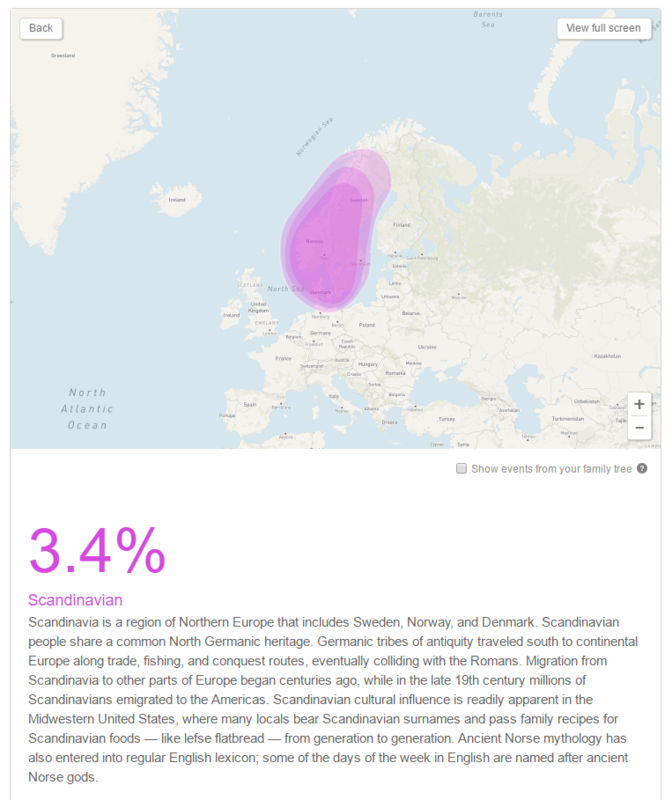 All supported ethnicities - Click on “All supported ethnicities” to see all the populations of the world we compared your DNA with, even those to which your DNA does not match. On the left side, a view of your ancestral ethnicity broken down into percentages for each region from which your DNA was inherited. On the right, an interactive world map highlights the regions of your ancestral origin. Click on a population listed on the left hand-side to be taken to a zoomed in view of that particular region on the map. The three levels of opacity show you the geographic boundaries of what we include in these regions. The darker it is, the higher is your percentage of ancestral origin is in this particular region. You can zoom in and out to browse through the map and see more details. Tip! Click on ‘View full screen’ in the top right corner of the map to maximize the map. In addition, you can click on the checkbox ‘Show events from your family tree’. This adds to the map the main life events of your direct ancestors, such as births, marriages and deaths. It allows you to compare the regions in the family tree to the ethnic regions estimated by DNA. The circles with the number of events are based on the locations you specified in your default tree. Click on a number to view the events for this region. Keep in mind that, due to immigration, the locations of events in the family tree might not correspond to the ethnic regions. For an enhanced view of all family tree events and locations, learn more about the MyHeritage PedigreeMap™.